You may have seen the beautiful colors of India in pictures of the biggest Hindu festival called Diwali. Occurring in October or November of each year, it’s a party that lasts five days, celebrating the victory of light over the forces of darkness. 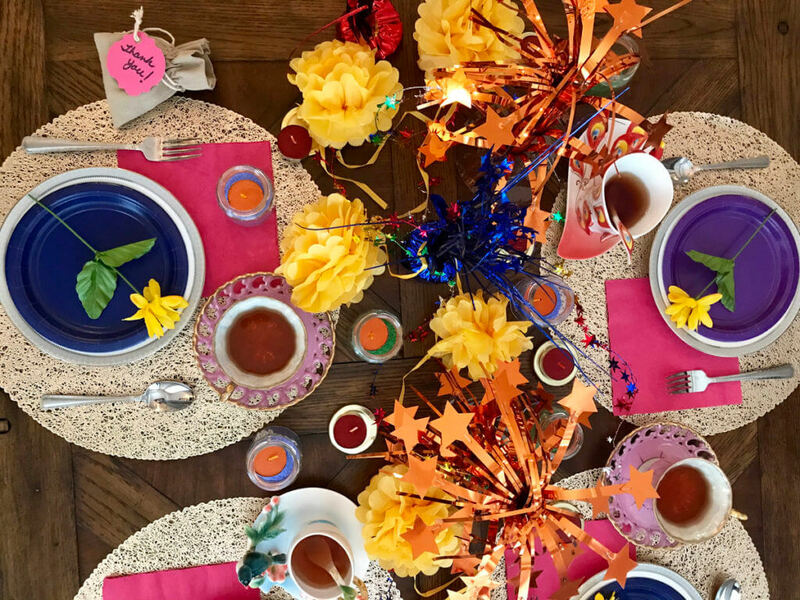 You can host your own colorful and light-filled Diwali-inspired gathering with these Diwali party ideas. During the festival, Indians arrange clay lamps outside their homes to symbolize the inner light that protects us from spiritual darkness. There are also fireworks, beautiful strings of lights, and a variety of flowers. Because it’s held in the fall, and was originally a harvest festival, I loved the idea of a rustic wood background mixed with bright colors that pop off the table. Use loads of small and large candles to make those colors come alive. I wanted to recreate the essence of fireworks in my décor. Fireworks made me think of balloon weights you can get at the dollar store; they’re made of a heavy puck covered in shiny, foiled colors. They create an eye-catching firework-inspired centerpiece. During the festival time, Indians decorate their homes with gorgeous colored rugs called rangoli, and they use colored powders or sand to create intricate designs by hand. 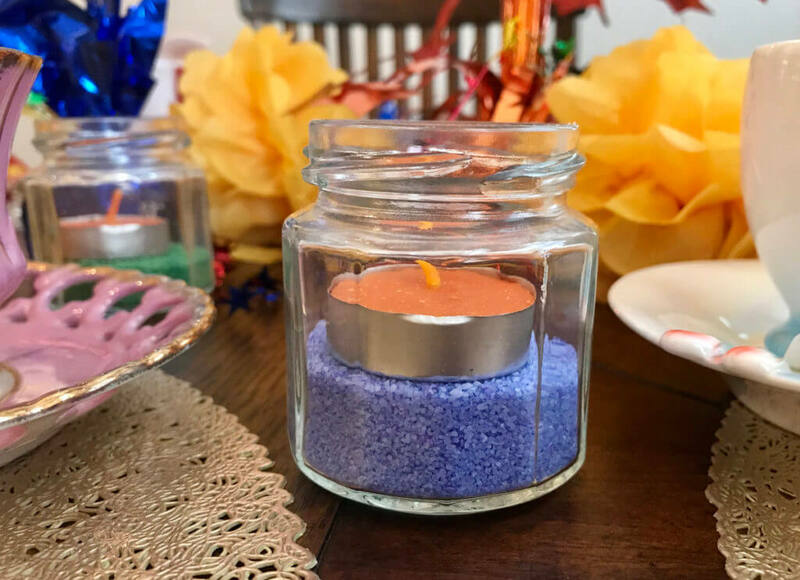 I incorporated this element of Diwali party ideas by filling small jars with different colored sand to create tea light holders. During Diwali, families gather to celebrate life and love, and especially the sharing of sweets. For your party, you might have some special go-to treats that you want to spoil your guests with. You can serve these as the main food event of your party, or package them as take-home gifts. The colored sands also made me think of bath salts, which I thought would make great little “thank you” gifts. 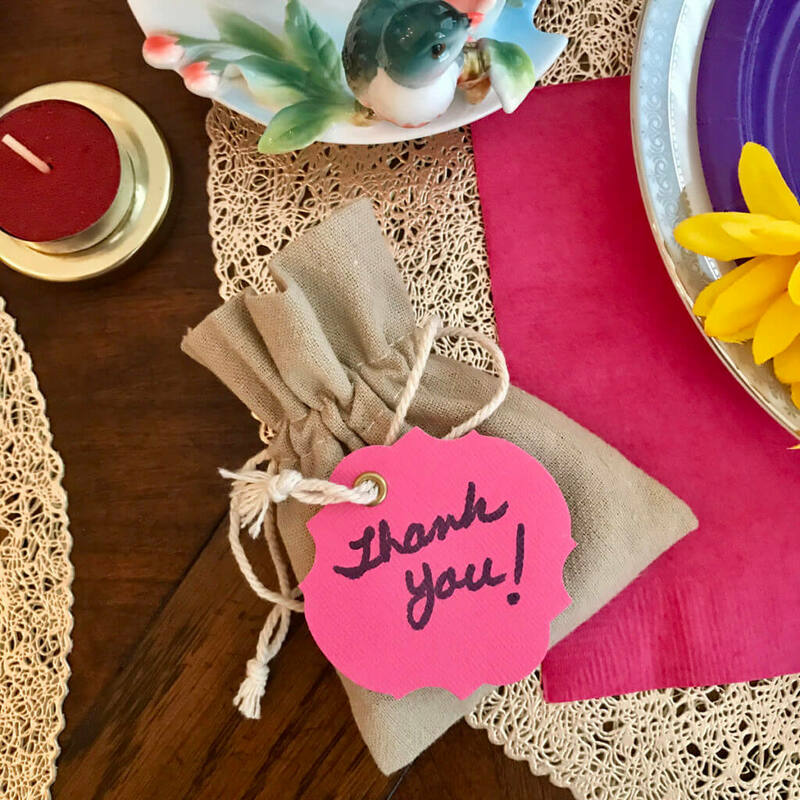 I made individual bags of bath salts and put them in burlap gift bags with personalized tags. Jasmine is one of the favorite flowers of the Diwali festival. 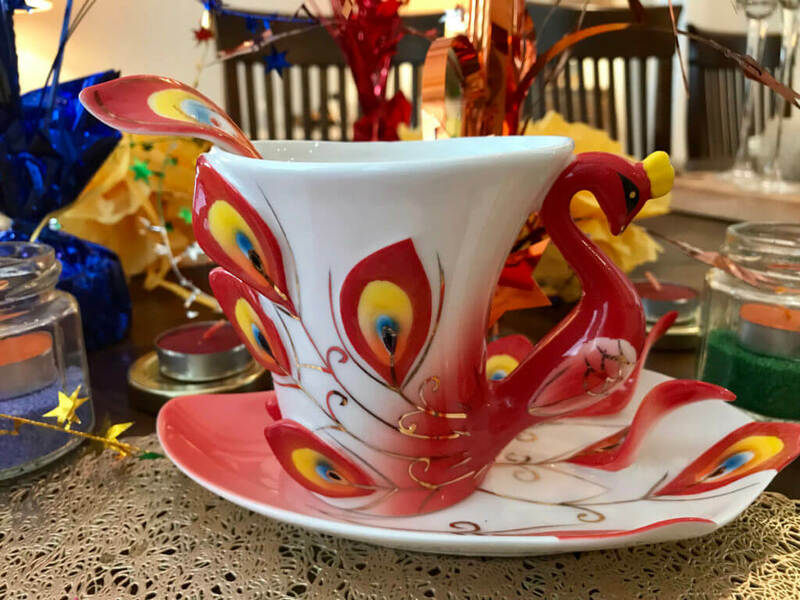 How about serving Jasmine tea to your guests? You could go with something like Garden Grove, which features cherry notes, or the Peace herbal blend with lemongrass for a caffeine free option. Tea is huge industry in India, so it makes sense to serve tea from the country’s various regions. Try a strawberries and champagne Darjeeling for an extra touch of celebration, or go with a classic breakfast blend of Assam and Ceylon teas. You’re sure to serve some Indian-inspired cuisine for your Diwali party so check out these Chickpea Chicken Curry Bites served on naan bread, which is a flatbread generally resembling pita. These curry bites are rich, flavorful, and full of delicious textured goodness. A Butternut Squash and Cauliflower Curry is an incredibly tasty vegetarian option if you’re craving curry, served with naan and creamy coconut rice. The veggies in this recipe taste so good soaking up those rich curry spices and flavors. Your guests will be asking for seconds! Indian sweets are mouth-wateringly delicious and simple to make. If you’re not familiar with their amazing array of sweets, check out these quick Diwali desserts. I think my favorites are the Patishapta, an Indian crepe with coconut filling, and the Coconut Till Ladoos, a three-ingredient dessert ball — just sesame seeds, dates, and dried coconut. These desserts will take your Diwali party ideas to the next level. Derive even more party inspiration from this Bollywood celebration that encompasses opulent settings, vivid attires, pulsating music, and dramatic performances. Diwali and Bollywood parties are unapologetically dramatic, lively, and boisterous. 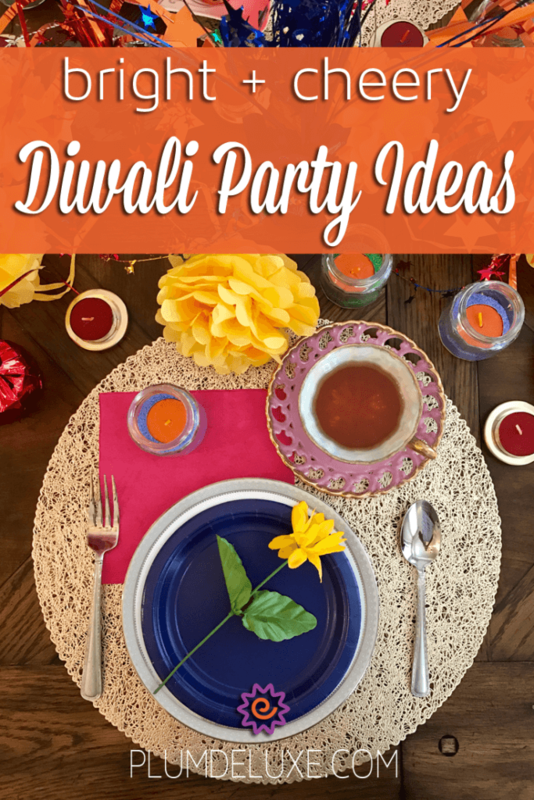 Take your guests on a colorful adventure with these Diwali party ideas. They will be wowed with an experience they will cherish.